Last week I had the pleasure of attending the 25th Association for Learning Technology conference (ALTC), and as it was the first time anyone from Titus Learning has attended, I wanted to summarise my thoughts from the day. ALT regards itself as an organisation that represents individuals and members from all over the world, with the aim of increasing the impact learning technology has. This was demonstrated when a speaker mentioned he’d come all the way from Australia and challenged to see if anyone had come from further afield. Suddenly a lone voice from the back shouted “New Zealand!”. The day started with a keynote from Tressie McMillan Cottom. If you’re not familiar with Tressie, she’s a highly esteemed learning technologist, sociologist and published author (she’s also appeared on The Daily Show with Trevor Noah). Tressie’s talk went into depth on the need to change department philosophy in order to successfully implement e-learning, an inspired start to the day. It was clear from the outset that this message of “increasing the impact of learning technology” was heavily integrated into the theme of the conference. Looking at the programme for the day, at any given time there were at number of brilliant sessions, coverings topics such as; co-design methods for technology, partnering experiences to boost outcomes, and transferability of open resources for global audiences. Whilst walking around the conference, it was clear to see the engagement and enthusiasm from all the people there. Spontaneous conversations with people from completely different fields were easy to come by, and a real sense of community was apparent just from the one day that I was there. For a first time visitor it was easy to feel welcome. 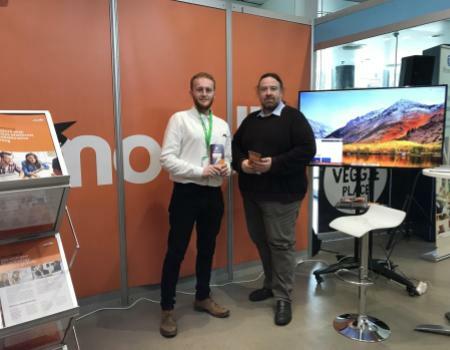 Moodle had a stand at this years ALT, and it was a pleasure to catch up with Gavin , Garnett and Doug from the central team. As a Certified Moodle Partner we always value the opportunities we get to meet with the Moodle team and discuss upcoming developments. After a short break I attended a session on “Analytics for tracking student engagement”, A really interesting session from The Open University. By tracking the number of users that accessed a revision tool prior to an exam, they showed how those students statistically scored much higher on exams. Analytics have improved massively in the newer versions of Moodle and it’s something we’re increasingly implementing and developing for our clients, so it was great to see success stories from other Moodle users. After attending a couple more sessions on Learner Dashboards, and how MOOCs are facilitating student transitions, the day gradually came to a close. A complimentary drinks session was hosted in the main exhibition room with live music, another chance to talk with some interesting people and learn valuable lessons. ALT 2018 was a great event for to attend, and one I learned a lot from. I’m certainly looking forward to next year. To learn more about the work we’ve done with Moodle, or to find out how we could help your school or organisation improve engagement, communication and learning outcomes, get in touch with one of our team.